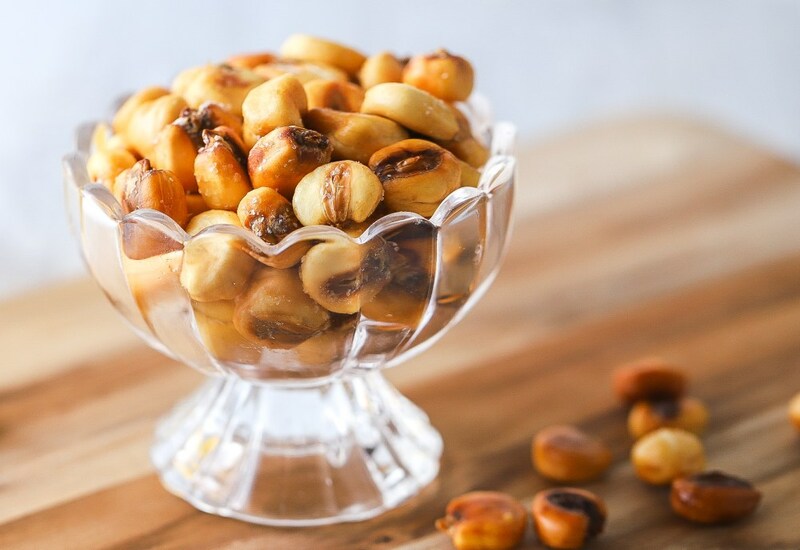 You will never eat store-bought corn nuts again after you taste these crunchy homemade corn nuts cooked in the air fryer. All you need is three ingredients: hominy, oil, and salt and about 45 minutes and you are set. Make them for game day, happy hour, or just a quick snack in the afternoon! Try different seasoning in addition to salt, such as garlic powder, curry powder, cayenne pepper, or black pepper. Per Serving: 69 calories; 5g fat; 6.1g carbohydrates; 1g protein; 0mg cholesterol; 411mg sodium. This recipe makes A LOT of corn nuts. I store the leftovers in an air tight container. These are a perfect party snack to serve with beer and pretzels or other bites. The giant white hominy can be found at most large grocery chains that have an ample Hispanic food selection. Don't buy canned hominy, it won't work! Must be dried and large. They turned out great! Mine and my grandma's favorite snack! These taste so good, especially with the salt. They are so crunchy! I know you're supposed to let them cool but I love eating them warm. Perfect snack and a nice salty alternative to popcorn or chips.